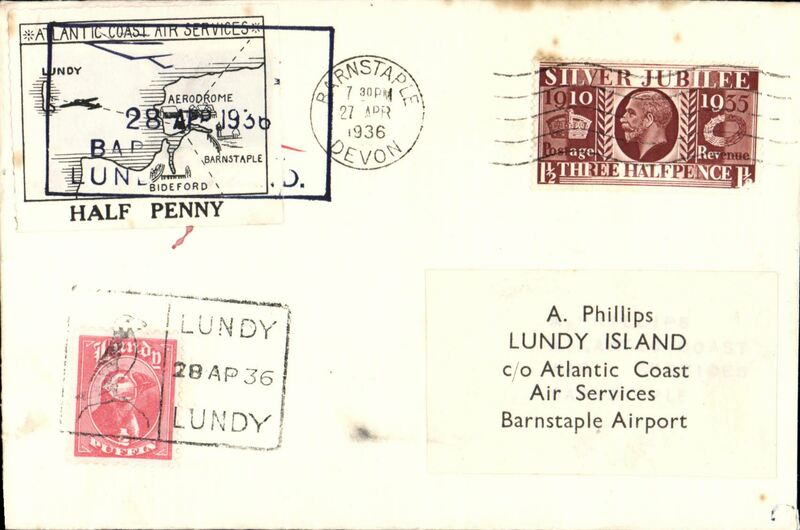 Atlantic Coast Air Services, early airmail Lundy to Plymouth, no arrival ds, plain cover franked 1/2 Lundy puffin local stamp and first issue Lundy 1d red/black air stamp (both affixed verso, as required) and tied by black rectangular hs, and GB Silver Jubilee 1 1/2d on front canc on arrival 'Barnstaple 8 Sep 1935' cds. 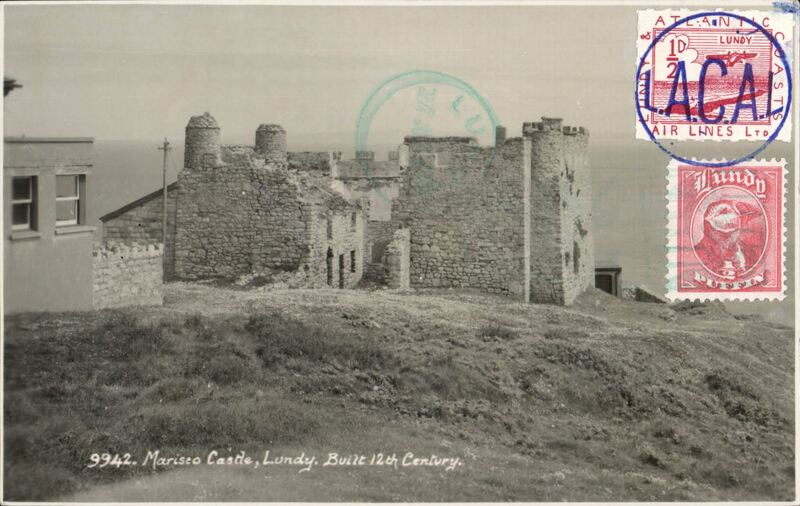 Mail from Lundy was posted on arrival at Braunton or Barnstaple. Nice item in fine condition. Atlantic Coast Air Services, early airmail Barnstaple to Lundy, arrival confirmed by black rectangular Lundy 28 April 36 cancellation over Lundy 1/2 puffin local, plain cover addressed to Barnstaple Airport, franked GB Silver Jubilee 1 1/2d (tiny cornerperf scuff), canc Barnstaple cds, and ACAS Lundy 1d second issue air stamp tied by black framed special ACAS. handstamp. Nice item in fine condition with all appropriate stamps, cancellations and handstamps. Few minor tone spots, see image. 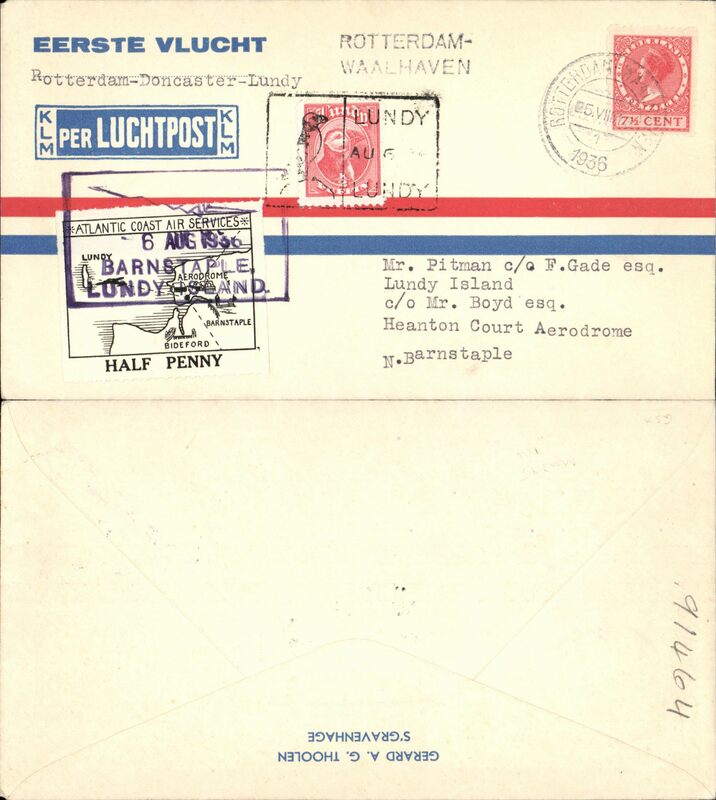 Incoming to Lundy Island from the Netherlands, red/blue/cream KLM company cover franked 7 1/2 cent, canc Rotterdam cds. 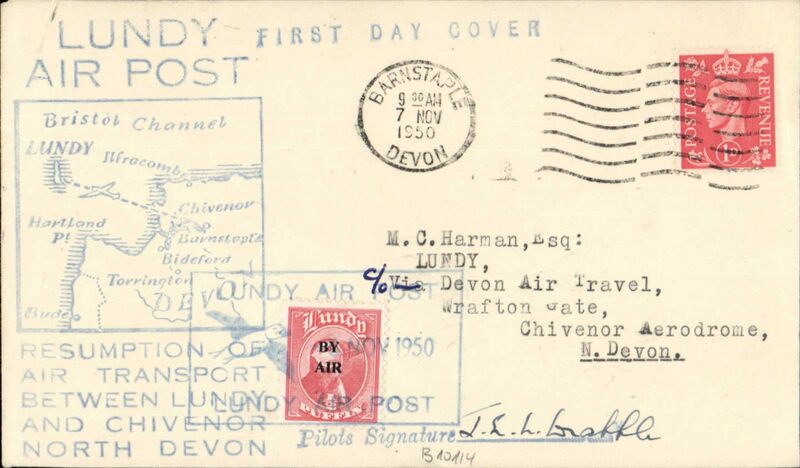 On arrival in UK cover flown from the North Devon Aerodrome, Braunton to Lundy, on arrival correctly rated 1/2d Puffin local stamp canc Aug 5 36 black rectangular hs, and 2nd issue Lundy Atlantic Coast Air Services 1/2d air stamp, canc violet boxed ' 6 Aug 1936/Barnstaple/Lundy Island' air cancellation. This is a nice exhibit item for the Lundy or Netherland specialist with the following unusual features - 1.Uncommon origin/destination, and 2. Correctly rated and genuinely flown into Lundy by private air post, operating quite independantly of GBPO. 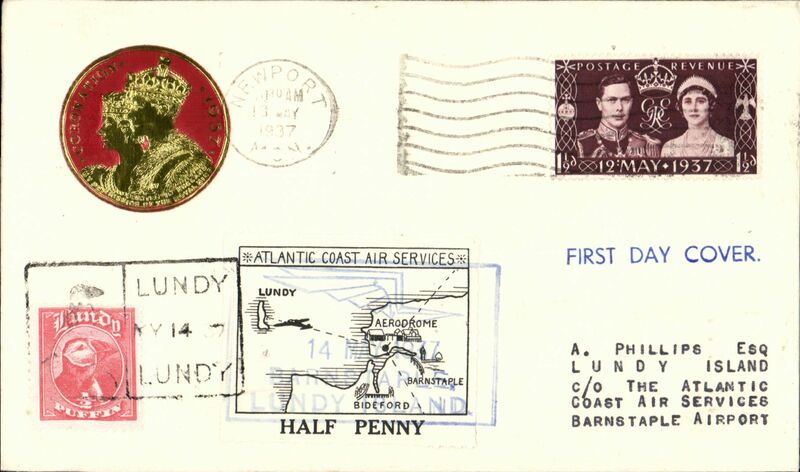 Flown cover, Newport to Lundy Island, franked FDI Coronation 1 1/2d, correctly rated Lundy 1/2d puffin tied by black framed 'Lundy My 14' arrival ds, and 2nd issue Lundy Atlantic Coast Air Services 1/2d air stamp, canc blue boxed ' 14 May 1937/Barnstaple/Lundy Island' air cancellation. Correctly rated and genuinely flown into Lundy from Barnstaple by a private air post, operating quite independently of the GB Post Office. 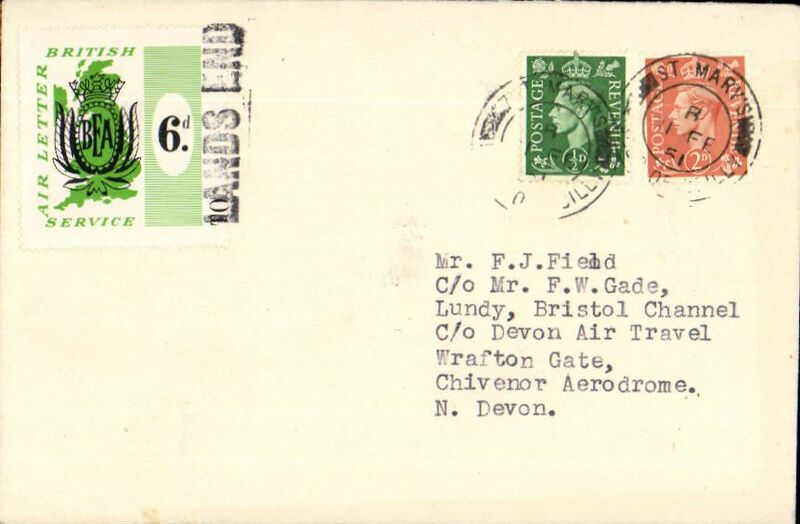 Cover flown on first day of 5th issue 1/2d claret, from Barnstaple, Devon to Lundy Island, carried from Barnstaple airport by Lundy and Atlantic Coasts Air Lines Ltd, plain cover franked GB KGVI 1 1/2d, canc Barnstaple cds, Lundy 1/2d claret canc blue circular 'LACAL' hs, also local 1/2d Puffin canc green framed 'Lundy Lights and:Leads' arrival ds, and Lundy/ 31 Mar 1939 postmarks. 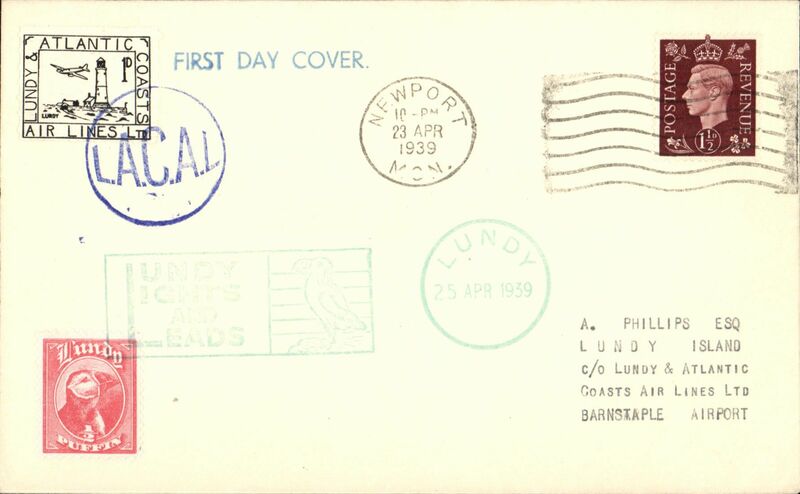 Cover flown on first day of 6th issue 1d black, from Newport to Lundy Island, carried from Barnstaple airport by Lundy and Atlantic Coasts Air Lines Ltd, plain cover franked GB KGVI 1 1/2d, canc Newport cds, Lundy 1d black canc blue circular 'LACAL' hs, also local 1/2d Puffin canc green framed 'Lundy Lights and Leads' arrival ds, and Lundy/ 25 Apr 1939 postmark. 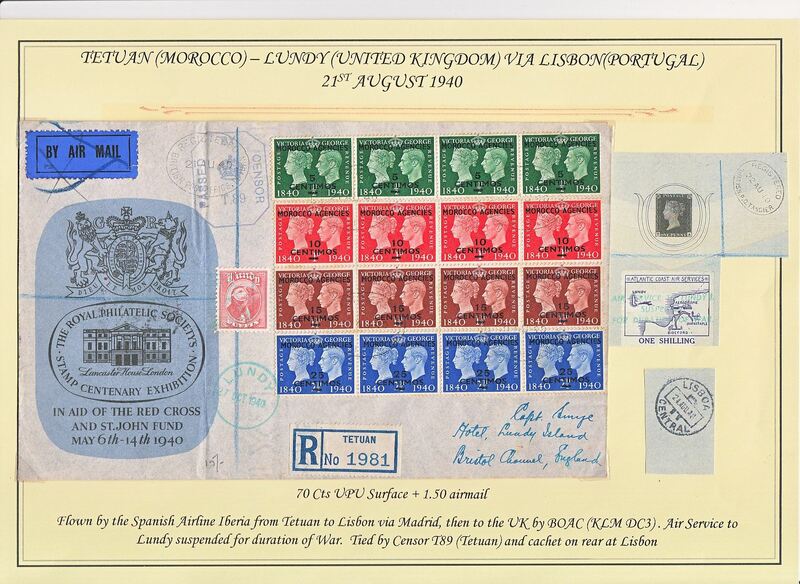 Cover flown from Barnstaple, Devon to Lundy Island, carried from Barnstaple airport by Lundy and Atlantic Coasts Air Lines Ltd, photo PPC showing Marisco Castle franked GB KGVI 1d, canc Taunton cds, Lundy 1/2d claret canc blue circular 'LACAL' hs, also local 1/2d Puffin canc green framed 'Lundy Lights and:Leads' arrival ds, and Lundy' hs. Inward airmail to Lundy Island, green 27 Oct 1940 arrival cds on front, from Tetuan, Morocco, via BPO Tangier 22 Aug and Lisbon, 24 Aug 1940 transit cds verso, Smye registered (label) Stamp Centenary souvenir cover, 21x13cm, franked Spanish currency Centenary set of 5c,10c,15c & 25c, each x4, canc oval 'BPO Tetuan/21 Aug 40/ Registered' ds, tied by Censor T89 (Tetuan), also 1/2d Puffin stamp on front, verso Atlantic Coast Air Services 1/- label with green three line cachet "Air Service to Lundy/Suspended/For the Duration of War", hence Oct 27th arrival and cancellation of airmail etiquette on arrival in England. Flown by the Spanish Airline Iberia from Tetuan to Lisbon, then to UK by BOAC(KLM DC3).A scarce and unusual item in fine condition. Devon Air Travel, F/F Chivenor, North Devon to Lundy Island, and FDC Lundy 1/2d Puffin stamp opt "By Air", cover franked GVI 1d postmarked Barnstaple/7 Nov 1950 machine cancel, blue two line "Lundy Air Post", flight cachet with blue framed map of route between Chivenor and Lundy and blue five line "Resumption of/Air transport/Between Lundy/and Chivenor, North Devon" below, also blue straight line 'First Day Cover' hs, and 1/2d Puffin air stamp tied by blue framed "Lundy Air Post/8 Nov 1950/Lundy Air Post" cachet. Signed by the pilot J.L.L.Drabble. A lovely item. Double flown airmail cover, Lands End to Scilly Islands, and Barnstaple to Lundy Island, Francis Field cover franked 2 1/2d canc 'St Mary's/1 FE 51/Scilly Islands' applied on arrival, BEA green/white 6d 'Lands End' air letter stamp, verso Lundy 2p Puffin canc black framed "Lundy Air Post/23 Feb 1951/Lundy Air Post" hs. Nice item in fine condition. Jubilee Year, souvenir FDC franked FDI commemorative air set of 6. 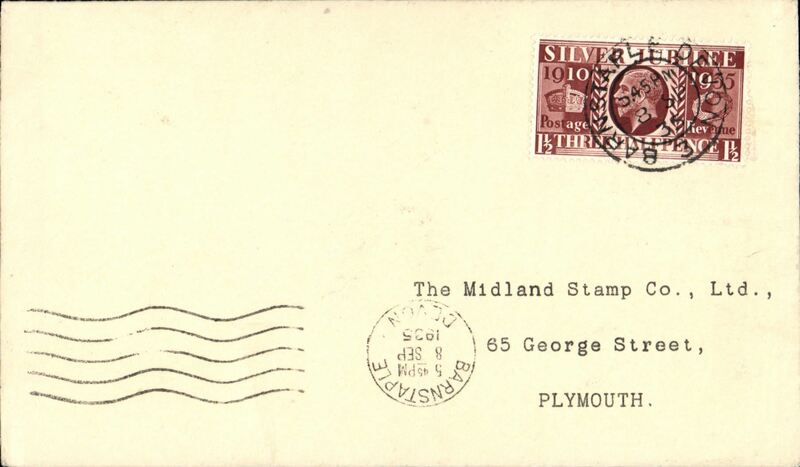 Cover flown on first day of issue of 1954 Silver Jubilee set of 6, from Braunton, Devon to Lundy Island, carried by Devonair Ltd on a ad hoc air service to Lundy Island, souvenir 'Silver Jubilee First Day Cover/1929-1954' franked QE , canc Braunton cds.